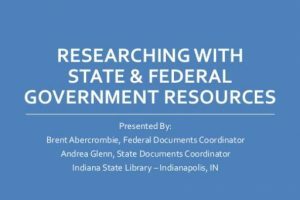 The Indiana State Library is pleased to share a recent webinar given by Federal Document Coordinator Brent Abercrombie and State Documents Coordinator Andrea Glenn titled Researching with State & Federal Government Resources. The webinar provides an introduction to the size and scope of government information that is produced. Brent and Andrea cover many state and federal resources and websites. The webinar was targeted towards librarians and teachers, but anyone interested in learning about government websites would find value in the information presented. ISL plans to present future webinars relating to government information later this year. The webinar is hosted on the Indiana State Library YouTube channel here. To access the full PowerPoint presentation, please click here. If you have any questions relating to federal documents/information, please feel free to e-mail, Brent Abercrombie, at babercrombie@library.in.gov. For questions relating to state documents/information, please contact Andrea Glenn at aglenn@library.in.gov.